The buddy comedy, with its mismatched partners and screwy conflicts, has long been a Hollywood institution. The genre has established major staples throughout film’s history, from the silent Laurel and Hardy films of the ‘20s to director Shane Black’s own rowdy “Lethal Weapon” in the ‘80s. Having worked with Mel Gibson, Black must be used to working with the crazy and stubborn — which explains how well he’s been able to navigate the film industry’s demands and still express his own voice. As the gap between independent and studio fare continues to widen, it’s remarkable to see how “The Nice Guys” flashes its own style. Taking place in a grimy 1977 Los Angeles, stakes are set high from the beginning of the film. Misty Mountains, an adult-film star, dies after a fatal crash. Shortly after, private detective Holland March (Ryan Gosling) is hired to find a missing girl, Amelia Kutner (Margaret Qualley), who happens to have a striking resemblance to Misty. In an inspired bit of bad luck, enforcer Jackson Healy (Russell Crowe) beats him up after Amelia noticed March tailing her — believing him to be a hitman. But when Amelia truly disappears, Healy comes to seek the help of PI, master klutz and former victim — Holland March. Using the lingering cynicism of post-Watergate America, “The Nice Guys” weaves together a captivating thread of the nation’s contemporary political climate — conspiracy. With Los Angeles smog and disillusionment serving as a backdrop, the film could easily veer into another preachy and overdone condemnation of “politics as usual,” but stays on the right side of the line more often than not. Black uses his resources wisely, putting the relationship between an ever doe-eyed Ryan Gosling and a barbarous Russell Crowe in the spotlight to counteract darker overtones. The two have an incredible rapport, firing off microexpressions and 12-gauges alike as if they were old pals. Having that at the forefront shines a light on some of the quickest and funniest dialogue of the year. Acidic barbs are traded at each other like cards, mach-speed insults with no remorse. The insults aren’t restricted by age either, with young daughter Holly March (Angourie Rice) often chiming in with stultifying digs of her own. The action is delivered steadily throughout and by way of a few fantastic set pieces, the very best being anchored by hitman John Boy (Matt Bomer) at an explosive car expo. Most of the film’s fight scenes have a slapstick quality to them, lending a sense of levity to whatever March or Healy are up against. In the vein of filmmakers like Jon Favreau, whose signature visual style is a lack thereof, Shane Black does little to flex the film’s visual muscle. Instead, he relies on his and co-writer Anthony Bagarozzi’s script to deliver the personality. This doesn’t come as a surprise, especially considering Black’s own background as a screenwriter. He’s able to incorporate hallucinogenic bumblebees, mermaids and, in one of the film’s most memorable scenes, Nixon angels without flinching because he’s able to find broader humor even in the more absurd. A dedication to economical storytelling also keeps the engine running hot, unafraid to pull the trigger and raise stakes for the greater good of the film. What ultimately holds back the film from greatness is its adherence to formula. Despite the Blackisms and some of the funniest performances of the year, there’s nothing groundbreaking in structure or story. A few weak spots also lie towards the end of the film, with a few awkward speeches that seem parroted from an undergrad who just discovered the military-industrial complex. 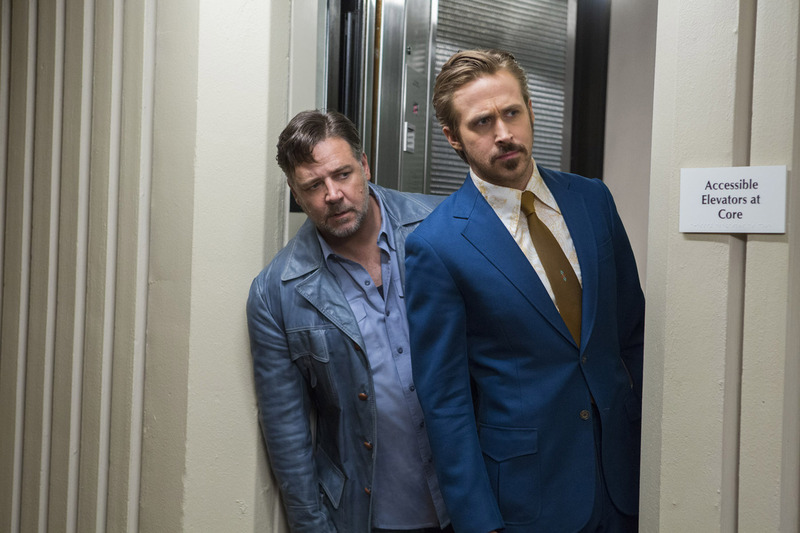 “The Nice Guys” is a comfort food and a delectable one at that — destined to roam cable reruns but get you cozily seated after landing on the channel. This may not have the aspirations of fellow ‘70s LA mysteries like “Inherent Vice” or the suave of Robert Altman’s “The Long Goodbye,” but it’s a blast nonetheless. Bound together by circumstance, these urban cowboys are worth watching ride off into the sunset.